1.1 ALSO READ- Android Pie Launcher For All Android Devices. 1.3 ALSO READ- POCO Launcher For All Android Devices. MIUI 10 is available for Samsung Device officially and you can install MIUI 10 in Samsung devices. MIUI 10 is the latest MIUI version till date & MIUI 10 has some latest features with better ram management and with more battery usage. MIUI 10 has an android pie like volume controls, traditional volume controls are change now means the new android volume controls are present in MIUI 10. Samsung devices have now MIUI 10 support and better UI. Samsung comes with traditional UI and compares to miui the look and feel of Samsung stock UI are too boring and not attractive. But miui 10 looks are really awesome and attractive. MIUI 9 is lightning fast and also very light skin UI and MIUI 10 is the updated version of MIUI 9. Usually, themes are battery consuming but MIUI themes have really fast and easy to handle UI. ALSO READ- Android Pie Launcher For All Android Devices. MIUI 10 comes with lots of new features and with different customizations. MIUI 10 is the customized version of stock android means miui has some quick and handy options which you can use easily to browse through different apps and to make your device look more attractive. 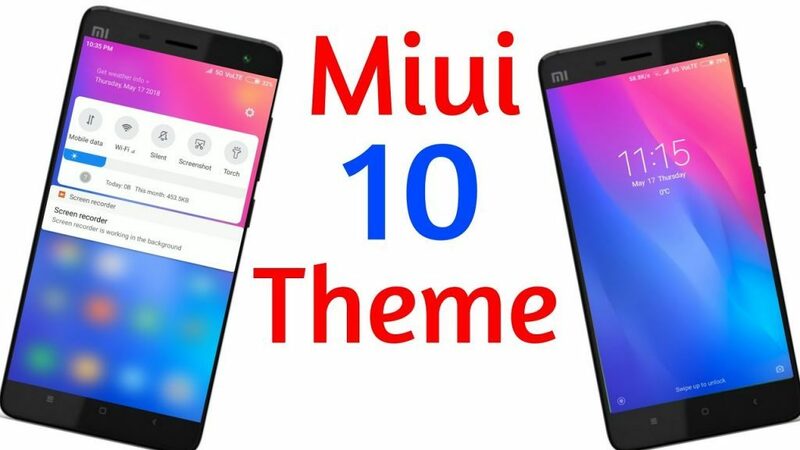 1-MIUI 10 Icons- MIUI 10 comes with different icon pack and you can install them separately using TWRP recovery but the theme has inbuilt MIUI 10 icon pack and believe me guys these icons look very attractive and easy to navigate while using these icons. 2-MIUI 10 Notification Bar- MIUI 9 has a traditional notification bar but in MIUI 10 update notification bar changes and you will get the blurry background like iPhone. iPhone has background blur when you are accessing notification bar and now you are getting the same feature in MIUI 10 theme. 3-MIUI 10 Dial-Pad- MIUI 10 dial-pad is slightly different from stock android dial-pad and you will get the same miui 10 dial-pad in the latest MIUI theme. 4-MIUI 10 Wallpapers- You will get all the default MIUI 10 wallpapers, these wallpapers are inbuilt you don’t need to download these wallpapers because the wallpapers are inbuilt in this MIUI theme. 5-MIUI 10 Quick Settings- Quick settings are the highlighted feature of MIUI 10 so this is the key feature of MIUI 10. These settings will help you to browse more fastly. ALSO READ- POCO Launcher For All Android Devices. These all features are the main features but there are some other features like setting and contact UI changed after installing MIUI 10 theme in Samsung devices. Samsung devices UI is not that good but can be changed using this theme. All the icons, wallpapers, quick setting, and other changes will make your Samsung device more attractive. No Root permissions are required. Then search for Samsung official themes application. Click install and then wait for downloading process. Once the application downloaded proceed further. You need to download MIUI 10 theme from requirements section. Then after downloading, open file manager and downloads folder. Install the theme from there. Then you need to open the Samsung theme application. From there you can apply MIUI 10 theme in your Samsung device.